The University of Adelaide Law School is celebrating its 125th anniversary this year. Its rich history is brimming with graduates who have become leaders in legal and political arenas. And for some families, Law at the University of Adelaide is almost a tradition. When Hannah Doyle graduated from the Law School in December 2008 she was following in some very familiar footsteps. Hannah's father is Chief Justice of the Supreme Court of South Australia, the Honourable John Doyle AC, who is also a law graduate of the University of Adelaide. He was due to receive an Honorary Doctorate from the University in the same ceremony as Hannah. 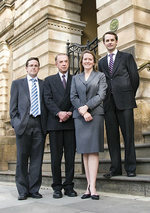 Then there is Rachel, Sam and Ben - Hannah's older siblings and all graduates of the Law School and now practising lawyers. Hannah's other sister, Miriam, broke with tradition and studied physical education teaching at the University of South Australia. She is working at St Ignatius College. The University of Adelaide Law School was founded in 1883 as one of a small group of institutions that pioneered the teaching of law as a university discipline in the English tradition in the 19th century. It is the second oldest law school in the country to teach the LLB degree, after the University of Melbourne. When Chief Justice Doyle enrolled in Law in 1963 the number of law students passed 100 for the first time and only a few were women. Today the University of Adelaide Law School is one of Australia's premier law schools and a centre of cutting-edge legal research with over 1400 students and 57% of them women. "It was a much smaller Law School in my day. All the students knew each other and we certainly knew the staff well too - some of them were not a lot older than the students," said Chief Justice Doyle. Some of those staff also taught his children. Dr John Keeler, a good friend and still associated with the Law School as an Adjunct Associate Professor, joined the Law School staff in John Doyle's second year of study. He also taught all four Doyle offspring. Another very good friend, Andrew Ligertwood, Reader in the Law School, was a student with John Doyle and taught the younger Doyles, as did Emeritus Professor Horst Lücke. "It was another era then, a different world," said Chief Justice Doyle. "Most of us went to university every day of the week and for most of the day. It was all examinations and no continuous assessment." Law study in Chief Justice Doyle's time relied largely on English books and cases as there were few Australian law text books. John Doyle excelled at his studies and became the University's 61st Rhodes Scholar, undertaking his Bachelor of Civil Laws (BCL) at Oxford's Magdalen College. He did his articles with Kelly & Co and before many years was made a partner. During this time he also lectured and tutored at the Law School across a range of subjects. In 1977 he helped found Hanson Chambers and, at just 36, he was appointed Queen's Counsel. John Doyle became Solicitor-General in 1986 and Chief Justice in 1995. High academic achievement has continued into the next generation. All four Doyles did double degrees and both boys followed their father to Magdalen College to do the BCL, after winning Commonwealth scholarships. Other awards and honours are spread liberally throughout the family with Ben being the recipient of a Stow Medal and University Medal. Rachel graduated with a BA (Jurisprudence) in 1992 and LLB (Hons) in 1994 and practises as a barrister in Melbourne in industrial, constitutional and administrative law. Sam graduated in Commerce (1994) and Law (Hons) (1996) and is now a barrister at Jeffcott Chambers, working mainly in commercial law. His wife, Susannah Paton, also graduated with Law (Hons) in 1999 after completing an Arts degree in 1996, and now works in the Office of the Director of Public Prosecutions. Ben also did Commerce (2000) and Law (Hons) (2002) and practises as a barrister at Hanson Chambers. He is Treasurer of the John Bray Law Alumni Network. John Doyle's wife, Marie (nee McLoughlin), also studied at the University of Adelaide and was awarded a Diploma in Social Studies in 1967. The last Doyle, Hannah, graduated in Law (Hons) this December after already completing an Arts degree, majoring in Politics, and a Diploma of Languages in French. She has just started as an Associate to Justice Mansfield of the Federal Court. Chief Justice John Doyle flanked by his family (left to right) Sam, Hannah and Ben Doyle.